Tackling four of the most impressive Swiss Alpine passes by PostBus in one single day, thereby negotiating a total of 10,366 metres altitude: This panorama tour represents the ultimate experience for Alpine enthusiasts! On Grimsel, passengers trundle past glittering reservoir lakes and enjoy many arresting views. 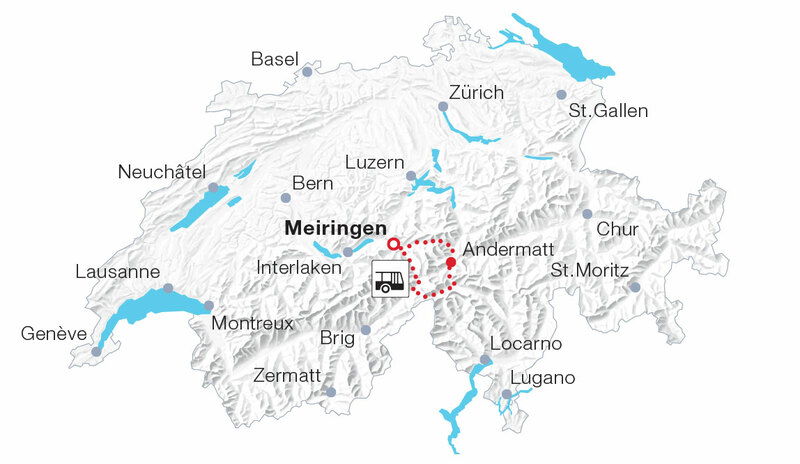 Pass Nufenen, Switzerland’s highest Alpine transition negotiable by vehicle, truly gets pulses racing. The Gotthard, nicknamed “King of Mountain Passes”, has been an important north-south trans-Alpine connection since the days of the Roman Empire. En route to the Susten Pass, the PostBus crosses no fewer than 25 bridges – and passes through just as many tunnels. The Central Alps Passes PostBus route is served by PostBus from June to October. Seat reservation required for groups of 10 and more persons. No surcharge applies.